Baking sourdough bread is intimidating. That’s just the truth. However, I’ve found that the more I make it, the easier it gets, and the more fun I have. I’ve probably only baked about 10 batches of sourdough bread in my life, but I wanted to share what I’m learning with you. It is truly so fun and satisfying to bake your own bread, and I just want people to give it a try. 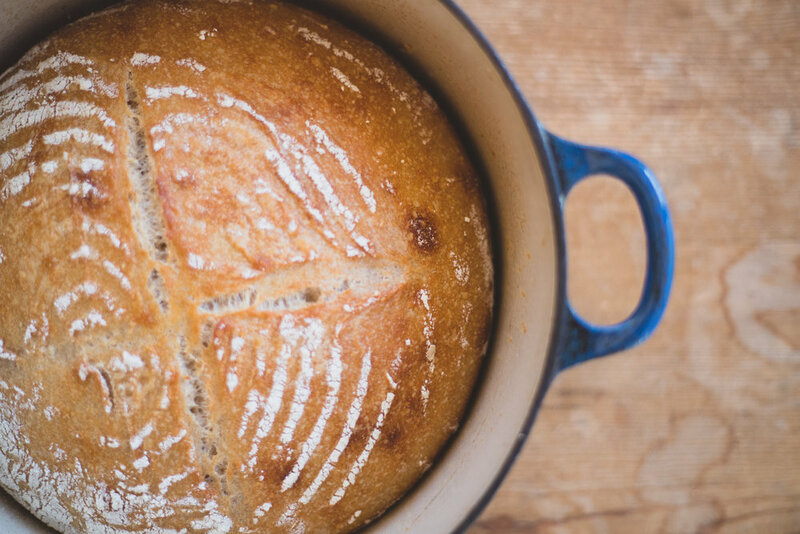 Second of all, there’s so many different ways to make sourdough out there that it can be overwhelming. Also, a lot of them take so much time and have really long, complicated recipes. I started making sourdough using the “Tartine Basic Country Bread Recipe”, but I’ve played around with it a lot and formulated my own version. I love this recipe because it can be done on pretty much any day off (whereas some take longer), and it’s really simple compared to some other recipes I’ve found online. Hopefully you can get a sourdough starter from a friend, but if not, you can attempt to make your own (I have tried... and failed... it takes quite a while), or buy one online! 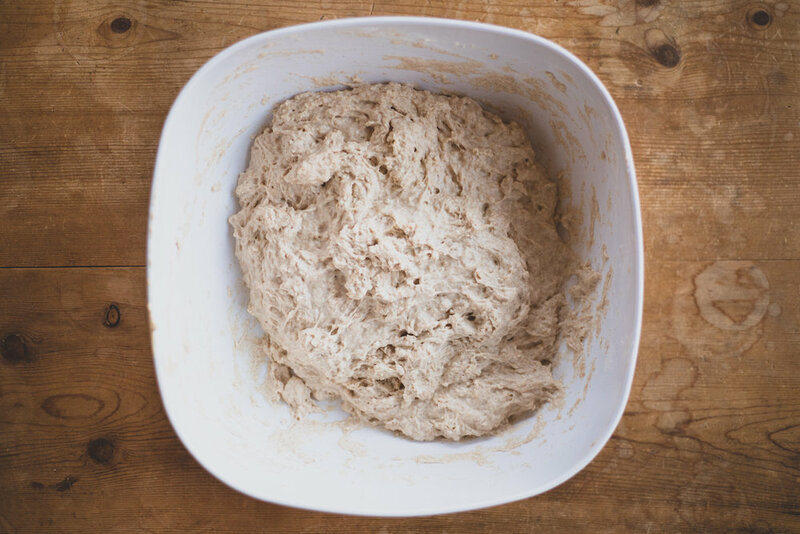 Whatever you choose to do, make sure that your starter is bubbly and alive when you start the bread-making process. Also, USE GOOD FLOUR. It makes such a difference. 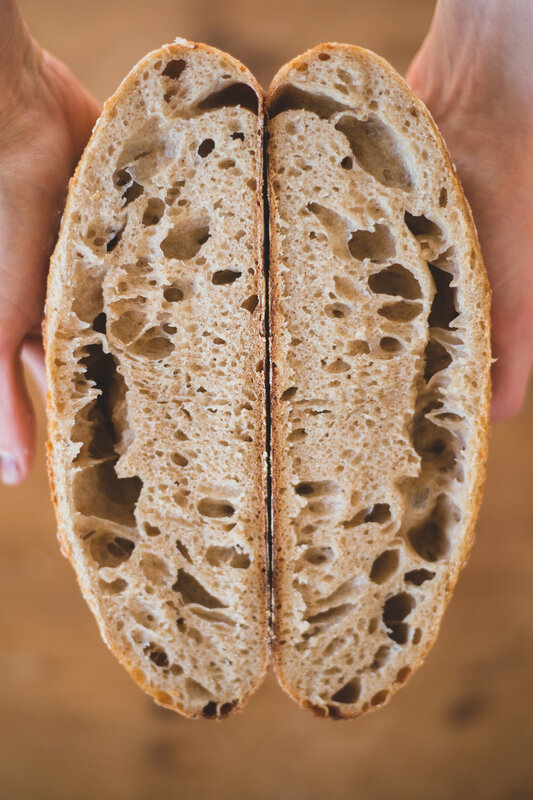 If you have access to freshly milled flour, then definitely use that. Normally I buy organic bread flour and organic sprouted whole grain flour from Whole Foods or another health foods store. I believe that it really makes a difference in the final product. The night before mixing the dough, prepare the levain. Mix the starter, water, and flours together in a bowl. Cover with plastic wrap and let sit overnight. NOTE: If I'm planning on baking the bread the same day, I start this in the morning. If I'm planning on letting the dough sit in the fridge overnight, this can be done in the afternoon. In a large bowl, mix together 200 g. of the starter and 650 g. of warm water until the starter is somewhat dissolved. Add 800 g. of bread flour and 200 g. of whole wheat flour. Mix with your hands until well combined. Cover, and let rest in a warm spot for 30-45 minutes. After initially mixing the dough together. After the dough has sat for 30-45 minutes, sprinkle with 20 g. sea salt and the remaining 50 g. of water to help the salt dissolve. Incorporate the salt and water into the dough by stretching and folding. 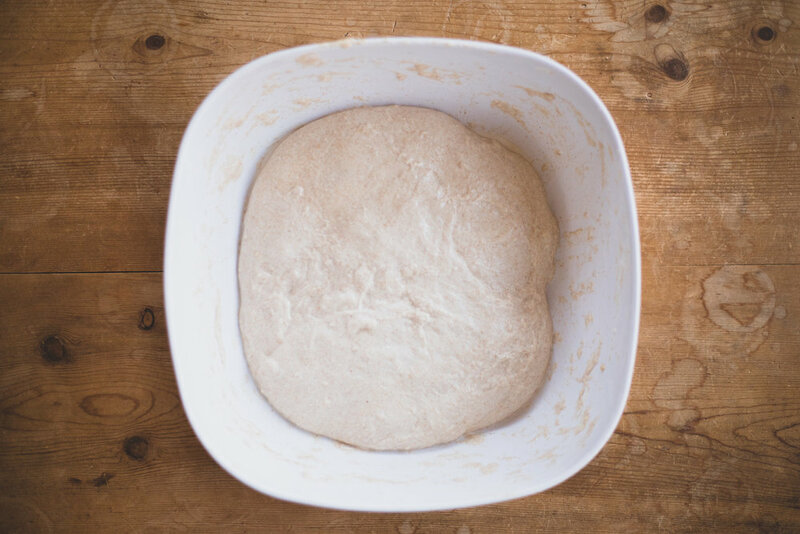 In order to stretch and fold the dough, scrape all the dough from the bottom of the bowl so that you can incorporate everything into the stretch and fold. Lift up the dough from one side, allowing it to stretch upward, then fold the dough in half. Repeat about 5-6 times, rotating sides. Before mixing in the salt and water. After mixing in the salt and stretching and folding a few times. Let the dough sit, covered with a towel, for 3 hours. Every 30 minutes, using wet hands, stretch and fold the dough 4 times. You should perform 4 total sets of stretches and folds, spaced roughly 30 minutes apart, then let the dough sit for the remainder of the 3 hours. 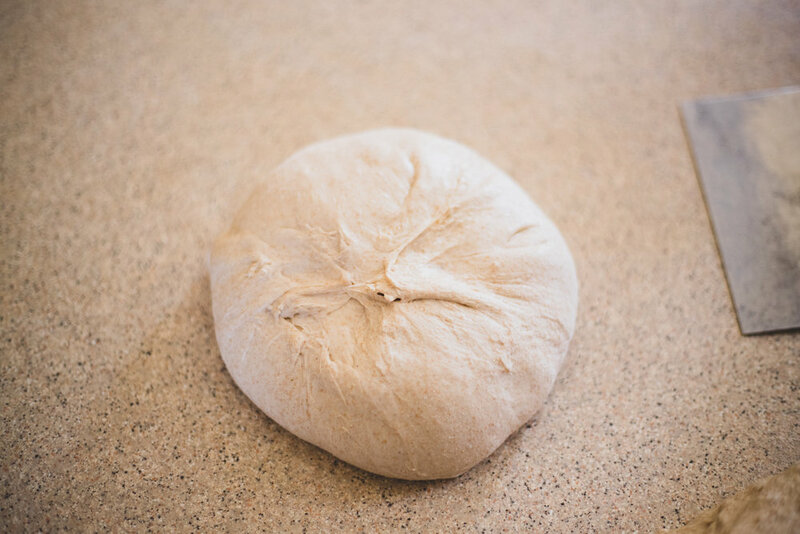 As you perform sets of stretches and folds, the dough should feel progressively more buoyant and aerated. The dough will go from feeling very sticky and loose to more smooth and tight. After the last set of stretches and folds. After 3 total hours of bulk fermentation. 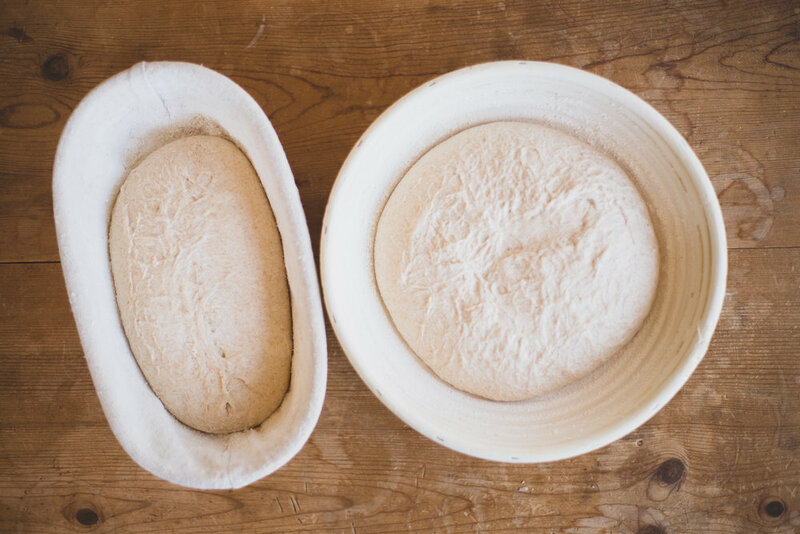 After bulk fermentation, gently scrape the dough out of the bowl onto a work surface. Sprinkle the top of the dough with flour. Cut the dough in half. Take a piece of dough and flip onto the floured side. Create a boule by pulling the edges of the dough toward the middle and pinching the ends together in the center of the dough. Repeat with the other piece of dough. Flip back over so the seam side is down. Take a dough scraper, place underneath the dough boule, and gently push away from you then toward you, tucking the bottom under, making the top of the boule tighter. Cover the boules, and let rest for 15-20 minutes. While the dough is resting, prepare the proofing baskets. I have bannetons, but you can easily use a dish towel resting in a bowl. Sprinkle the proofing basket or dish towel generously with flour. Sprinkle the dough boules with flour, and reshape, following the process used before. Once shaped, place in the proofing baskets seam side up. Cover with a towel and let rise in a warm place for 3-4 hours. At this point, you can choose to put the dough in the fridge to let it rise overnight. This will produce a more sour flavor. I usually choose to let it rise for 3-4 hours and bake it the same day. After the 3-4 hour rise. Place in the proofing baskets/bowl with a dish towel. Dough should be significantly puffier than before and have some large bubbles in it. Preheat the oven to 500 degrees F, and place your dutch oven inside while it's heating up. Once heated to 500, remove the dutch oven, and turn the heat down to 450. Grease the inside of the dutch oven and sprinkle with flour. Turn the loaf upside down from the proofing basket directly into the dutch oven. Take a sharp knife and cut a large cross on top of the dough. Spray the top of the dough boule with a spray bottle or sprinkle with a few droplets of water using your hands (this will help create steam inside the dutch oven, allowing the bread to rise). Put the lid on the dutch oven, and bake for 30 minutes. It's very important NOT to remove the lid during this time. After 30 minutes, remove the lid and bake for another 15 minutes, or until the loaf is golden brown on top.